Really gives a huge boost to power hungry headphones like the Senn HD 600s. I have only turned it up to about 1/2 of the volume range. Enough to knock me silly without hint of distortion. Inexpensive. has separate bass and treble controls. Very, very neutral. Well, I have waited for many years before purchasing a headphone amp. It just seemed to me that there were many people who purchased amps and expensive headphones and then lat them gather dust. So I waited and I researched and in the end, in part base on the three previous reviews for this product on this site, I purchased the Xenos. I should say that I also purchased a pair of Sennheiser HD 600s at the same time. Frankly, I am in heaven. True, I have no other products to compare with the Xenos but I will say that anything that can be so neutral has got to be good. That's neutral with the bass & treble pointing straight up. Turn the bass up and the bass goes up, no distortion or nasty stuff just pure low notes. The other thing that I should mention is that so far I have only used the Xenos with rechargeable batteries. I still have to plug in the mains power. But I have an amazing power cleaner and other stuff on the line and anticipate no problems on that score. The build of this thing is not so attractive but hey, I've tucked it into a nice crevice where it cannot be really seen. The price is absolutely right on this piece of kit and if like me, you really do not know what you are doing in the land of headphone amps, this mp represents a minimal investment for a good return. Much discussion goes on about what people plug these things into. Most seem to take pride in the fact that they plug their head amps directly into their CD players. Well, I have a Music Hall CD player a Nakamichi LX-5 tape player that sounds like a CD player and a CJ Walker turntable that, when the records are clean, sounds like pure cream. I wanted to listen to them all through the headphones so I connected the amp through the second tape out on my Quad 44 pre amp. Frankly, unless I am missing something, things sound exceptionally good to me and, bye the way, they also sound good to a family friend who owns one of the best audio repair shops in Toronto. Do yourself a favour and check this great, low price product out. Impressive sound quality (good detail, nice bass). Low price. Lack of a crossfeed processor option (It seems that will be available in 2005). I have been using the Xenos 3HA during the last 3 weeks and I am very pleased with its operation. 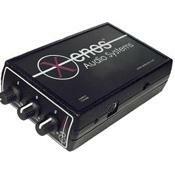 I have used the Xenos 3HA connected to the tape loop of my amplifier and also to a portable MP3 player. The sound is very good (I use Sennheiser HD590 headphones) and it is much better than the headphone output of my amplifier. The bass-treble controls allow me to use the bass control to slightly reduce the low frequency gain to compensate the increased bass perception in headphone auditions. The amplifier can fed from the network using the supplied network adapter or from a set of 4 AA batteries which enhances its portability and, then, its usability with portable sources. I think that it’s a great buy with a high quality/price ratio. So, I recommend it. It is important for me to note that the customer service is excellent with promptly responses to any communication (I used the e-mail) and with a notable concern for the customer satisfaction. High-end sound quality, ease of use and set-up and of course PRICE,PRICE,PRICE!!! Mini-jack output for headphones...quality this good won't (shouldn't) be wasted on "buds" or "walkman" style headphones. I just recently purchased this unit directly from the manufacturer, as he lives a couple of blocks from me, and was impressed by his level of knowledge and professional attitude. After meeting the gentleman (Alberto), he took me on a small tour of his "shop" and took the time to answer all my questions in a language that was easily understood (not all of us are techies). Upon arriving home I took the unit out of its well packaged box, read the manual and proceeded to hook the unit up. I normally allow all electronic devices a little "burn-in" time, however, with the new toy in hand, I just had to try it out immediately. Well, I must admit, right out of the box the Xenos sounded pretty darn good. It absolutely blew away the headphone output from my Sony portable Mini-disc ! Three days of running with a Marantz CD63-SE and a pair of Grado SR-125s, I sat down for some serious listening. My wife who is an audiophile with quite accurate ears joined me for the fun. We sat out front on our little patio area in the shade, and set the atmosphere just so, and away we went. We were making so many comments like "wow, did you hear that" and "I never heard that before", that our neighbours came over to see what was up. After passing around the headphones a couple of times, we all agreed, superior product for a more than reasonable price !!! I did find that the power supply that came with the unit sounded a bit more extended at the frequency extemes, than using the battery operated option. I can't help but wonder what this unit could sound like with a "beefed-up" power supply !!! I have been using this Xenos 3HA with my Meridian and Classe` CD players and am amazed at the quality you can buy under $200.00. Extremely highly recommended...thanks Alberto !!! ATP Systems to the rescue. The X3HA is small but powerful. It provides not only a boost in volume (I have yet to turn the volume to maximum output) but also gives you control of the treble and bass. I found the X3HA easy to set up, easy to use and adjust, and very reasonably priced. You also don't need to purchase special or expensive headphones. I was going to stand the X3HA on one side to save desk space and could not since there is an input, output or control on all four sides. Nitpicky! One word: Quintessence. As a consumer I am not easily impressed. ATP Systems provided exceptional customer service that is truly impressive and at a very reasonable price. I was having difficulty hearing audio recordings of meetings. First I switched to a digital recorder then added a boundary microphone. The recordings were still difficult to hear so I started looking for a headphone amplifier. Most of the headphone amplifiers I found were designed for audiophiles. The price - several hundred to several thousand dollars. A shopping trip to local stores revealed a notable lack of availability (at Best Buy I was told there was no such thing). Finally, I found a $20.00, battery-powered "volume booster" at Radio Shack. It should have been free because it does not provide a noticeable boost. Give Alberto, at ATP Systems, a call or drop him an email. After one email, Alberto replied promptly with a note that he could ship me an X3HA the next day if I could use PayPal. After sending the payment, I got another email acknowledging payment had been received. As promised the X3HA was shipped the next day using DHL. According to the shipping documents, DHL picked up the package in Toronto, Canada at 4:30 pm on Thursday. Within 16 hours, I was holding the X3HA in my hand, in Boise, Idaho. Only 5 minutes later I had everything set up and was testing the X3HA. First I just listened … because I could hear it (even the voices that were across the room from the recorder - it was a conference with 28 people in the room) … then I started playing with the treble and bass controls and noticed that I could make fine adjustments to increase the clarity of the voices.